Pearl and Hermes Atoll is a true atoll that is primarily underwater and has numerous islets, seven of which are above sea level. While total land area is only 0.36 square km (80 acres), the reef area is huge, over 450 square miles (194,000 acres). The atoll is ever-changing, with islets emerging and subsiding. The atoll was discovered by Westerners in 1822 when two English whaling ships, the Pearl and the Hermes, wrecked on the reef during a storm. Since then at least six other vessels have been lost in the area. In 1854, King Kamehameha III claimed the atoll for the Hawaiian Kingdom. Due to the atoll's small land base, it was largely spared the ravages of miners and feather hunters. When Westerners first arrived, the atoll abounded with birds. Presently, about 160,000 birds from 22 species are seen. They include Black-footed albatrosses, Tristram's storm petrels, and one of two recorded Hawaiian nest sites of Little terns. Endangered Laysan Finch were introduced in 1967 in an attempt to establish a "back-up" population in case disease, natural disaster, or other calamity exterminated the only other population in the world at Laysan. The sandbar islets support coastal dry grasses, vines, and herbal plants, including 13 native species and 7 introduced species. The plants survive because they are salt-tolerant and able to recover from frequent flooding events. Many fish species abound at the wreck site of the Quartette, ex-USS James Swan, a WWII Liberty ship lost in 1952. Though vessel losses and wreck deterioration often cause extensive mechanical damage to reefs, some remains can serve a more benign role as "artificial" fish habitat. Hawaiian monk seals and sea turtles breed and feed at Pearl and Hermes, and it is a mating area for spinner dolphins. 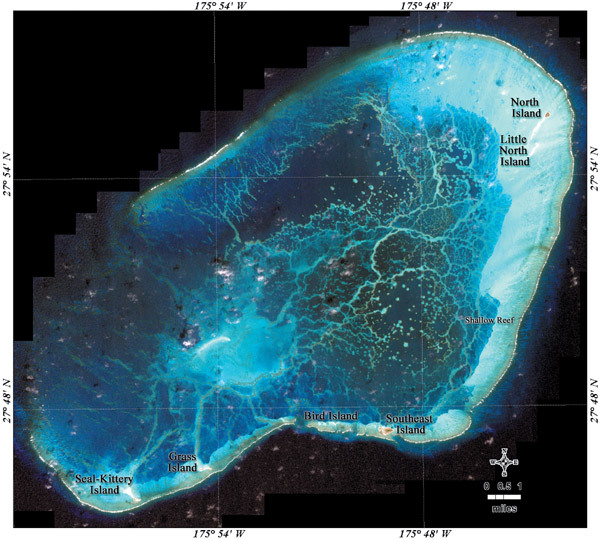 The atoll has the highest standing stock of fish and the highest number of fish species in the NWHI. These include saber squirrelfish, eels, Galapagos sharks, sandbar sharks, ulua (big jacks), angelfish, aweoweo (bigeyes), uhu (parrotfish), and numerous lobsters. In addition, angelfishes considered rare in the rest of the Hawaiian archipelago, such as the masked angelfish (Genicanthus personatus) and the Japanese angelfish (Centropyge interrupta) are commonly seen at Pearl and Hermes Atoll. Hiding between the unique reef and lagoons are very unusual invertebrate habitats. For example, several sponges collected recently may be new to science! Thirty-three species of stony corals have been documented here. Black-lipped pearl oysters, at one time very common, were harvested in the late 1920s to make buttons from their shells. Over-harvested, the oysters were nearly eliminated, and today only a handful remain even long after their harvesting was declared illegal in 1929. While there has been less human impact on this atoll than others in the NWHI, problems with marine debris and the occasional shipwreck still occur. In 2003 over 90 tons of marine debris was removed from the reefs at Pearl and Hermes. Minimizing human contact may preserve the wildlife and marine life in this extensive reef ecosystem.